This handsome Hugo Boss Men's Trophy sport watch is designed with the busy contemporary man in mind. Featuring a white dial, set on a yellow gold plated stainless steel case, and finished with the sleek bracelet straps. This is the perfect wristwatch for your everyday looks. 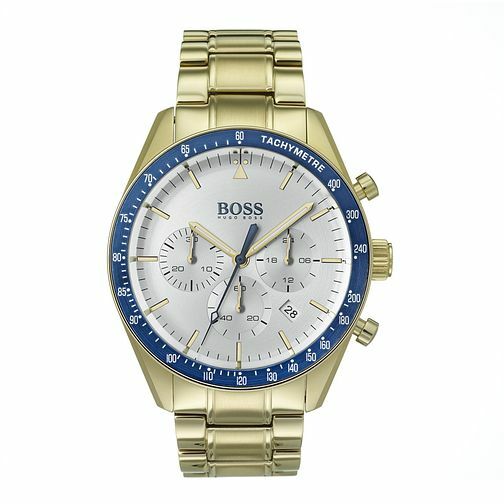 Hugo Boss Men's Yellow Gold Plated Trophy Sport Watch is rated 5.0 out of 5 by 1. Rated 5 out of 5 by Anonymous from Excellent piece of work A great piece of work from Boss looks alot better in person than the picture So if you like the picture you will love the watch in person.